Reviews – Bake With Me! Sometimes you may not have time to make a cake from scratch – so, here you’ll find my recommendations for some of the best cake mixes and products that can be found in the average supermarket. As you may know, every now and then I like to try out some of the cake mixes available on the high street. Even though I always say that baking your own is better, some of the packet mixes out there can be just as good and great if you’re new to baking or simply haven’t got the time to bake entirely from scratch. 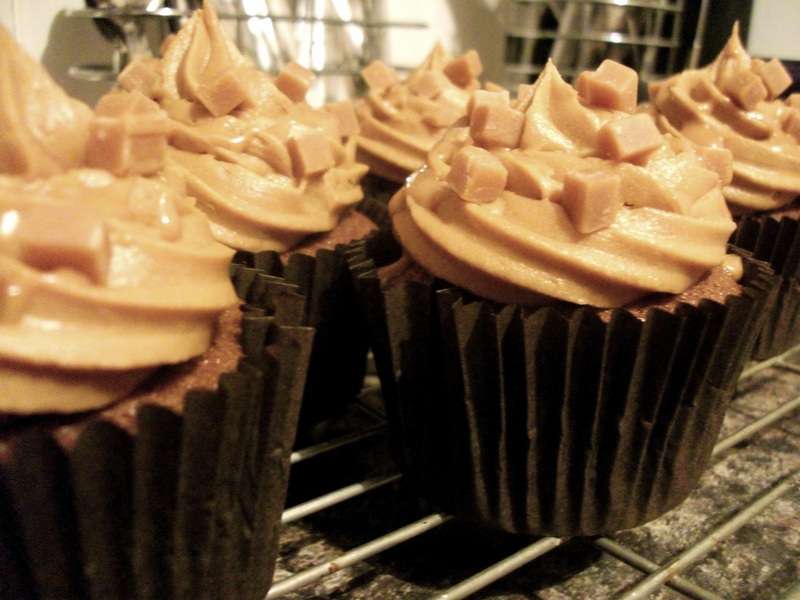 This week whilst shopping in Sainsbury’s, I spotted these Salted Caramel Cupcakes. Having seen that they were new to their baking range, I decided to test them out! Salted caramel sounds incredibly bizarre to me. The idea of having salt in or on a cake completely puts me off – salt and sweet should definitely not mix! 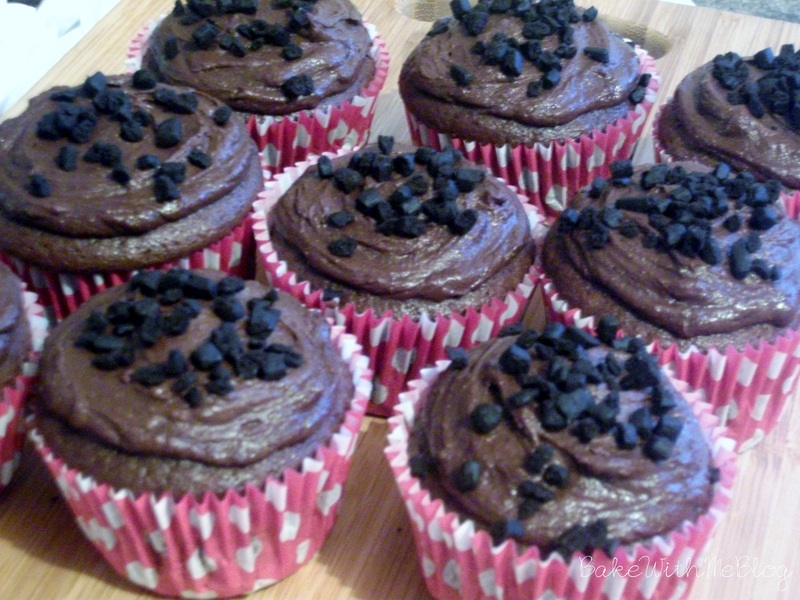 Nevertheless, seeing as I often see recipes for these online I thought I’d give them a go. Obviously I knew that when I baked them they wouldn’t completely taste of salt but that’s just all I could imagine! 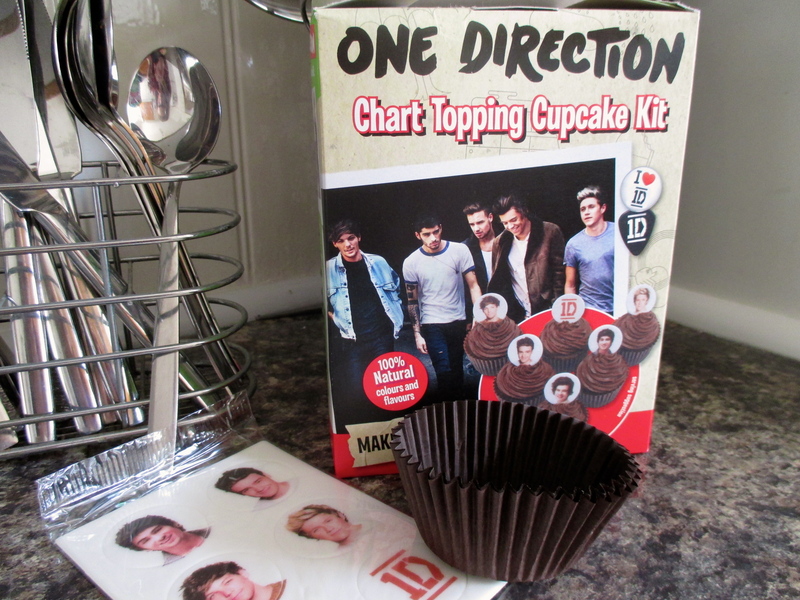 The cake itself was delicious, just enough mixture in the box to fill all 6 cupcakes mind. Nevertheless, they were deliciously toffee flavoured, light, fluffy and incredibly easy to make,with you simply needing to add water and one egg. For the frosting I had plenty of buttercream for all 6 cupcakes. I sometimes worry with packet mixes that when I pipe the icing, I’ll run out. I always start my piping sparingly yet by the last cupcake, I have way too much frosting left and as a result, the last cupcake always has way to much. Luckily, this was not the case with these, I had a good amount to evenly divide the buttercream between the cupcakes, giving each a generous swirl. 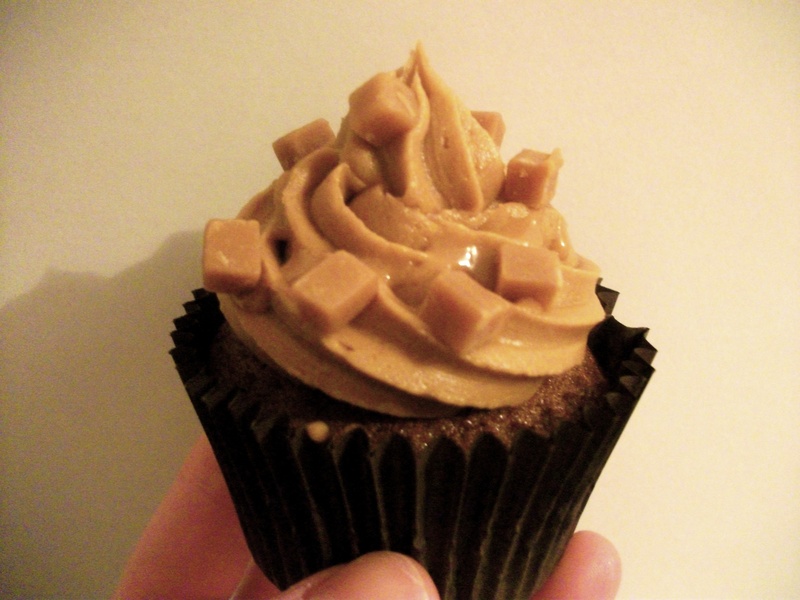 Included in this mixture was also a caramel syrup and fudge pieces for decoration. Completely ignoring the instructions I used cold water to make the syrup instead of hot as advised. I’m not sure what difference it would have made to have use hot water, but since the frosting is butter, I was worried that the heat would spoil the decoration. Unfortunately, my syrup didn’t drizzle as spectacularly as the picture on the box, just a few blobs here and there. I do however think that it was in fact the syrup which had the slightly salted flavour. 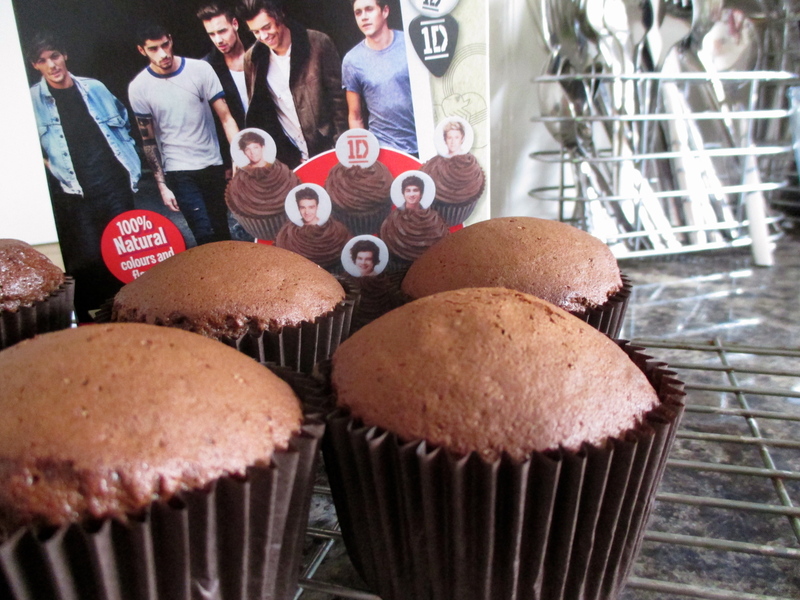 When you lick your lips after, there is a slight salty taste but it completely works with the cake. 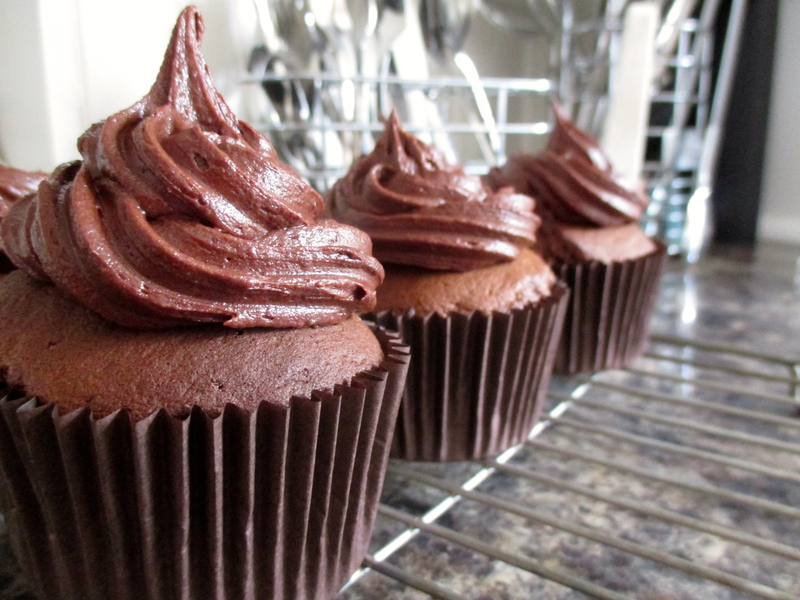 I think the fudge pieces add a nice fun feel to these cupcakes and make them look homemade. There is more than enough fudge to decorate your cupcakes with and maybe even a few spare for you to cheekily eat along the way. 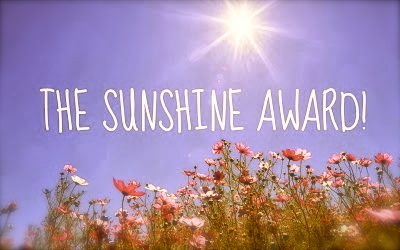 Overall, costing just £2.00 in Sainsburys, if you’re looking for something to do this weekend, they’re well worth buying, just to pass an hour or so on a rainy day – which if you’re in the UK right now, it most probably will be! 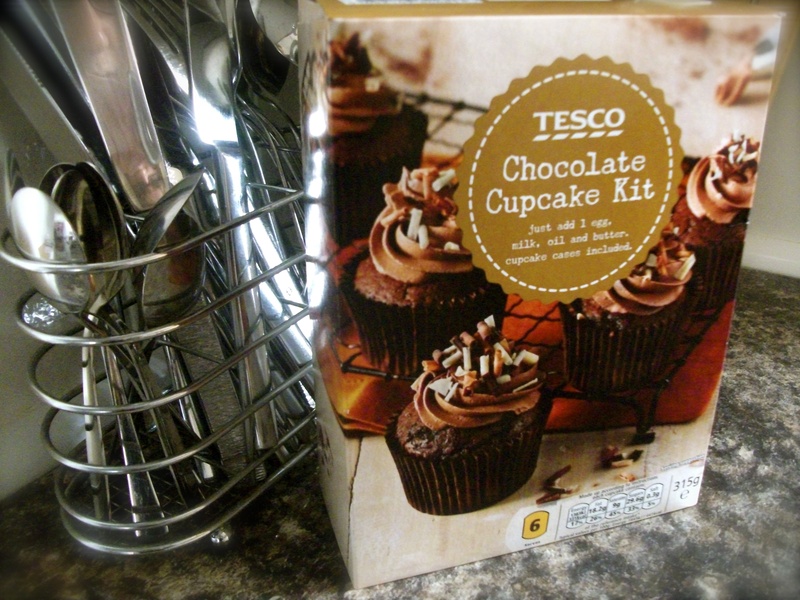 After absolutely loving this Lemon Cupcake mix from Tesco a little while ago, I decided to try the same mix but the chocolate version. 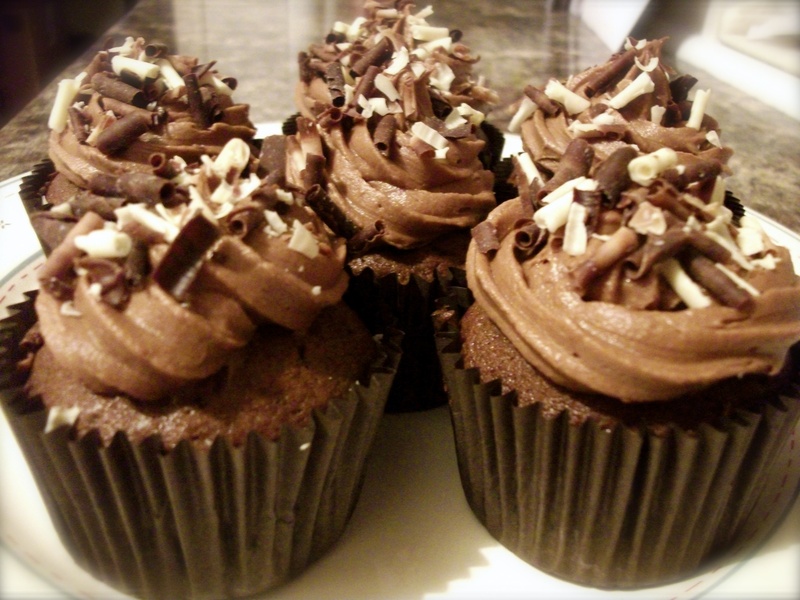 These were SO delicious with the cake being super soft and moist, and there being plenty of frosting with curls to give a generous portion on each cupcake. As always, they’re not as good as baking you’re own, but they were still pretty good! Like the previous mix, these are super easy with you just needing to add an egg, a splash of milk, oil and butter for the frosting. The cakes were a decent size and were easy to make with you just having to throw all the ingredients in the bowl. Whilst they were chocolatey, they weren’t too chocolatey which was good, seeing as aside from me, there aren’t many chocoholics in my household! There was more than enough frosting for each cupcake which is surprising for a packet mix and meant I could try out my new star nozzle for the piping! Costing just £1.39 in the supermarket, these are definitely worth giving a go. 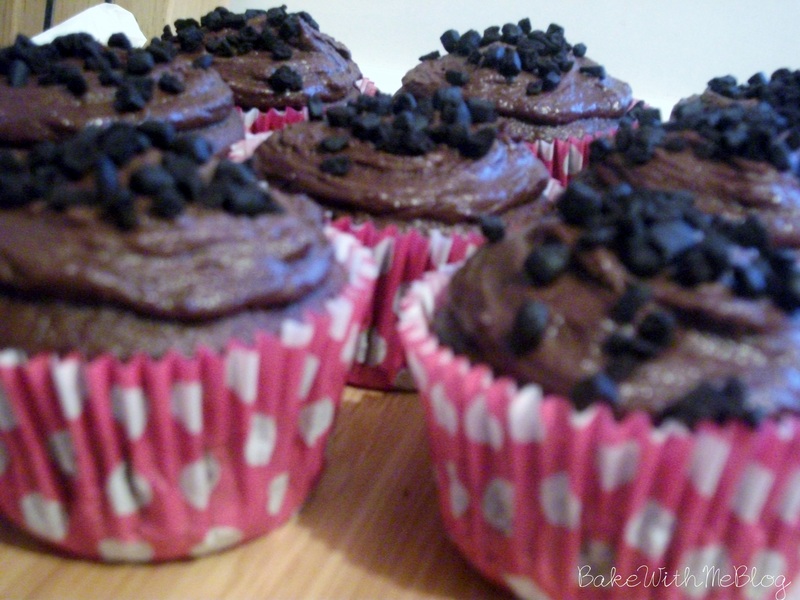 Whether its baking with the children or just if you have an hour spare, you will be thrilled with the cupcakes as a result! You may know that every now and then I like to test out some of the cake mixes that you can buy in the supermarket, as sometimes, we just don’t always have the time to bake a cake completely from scratch. 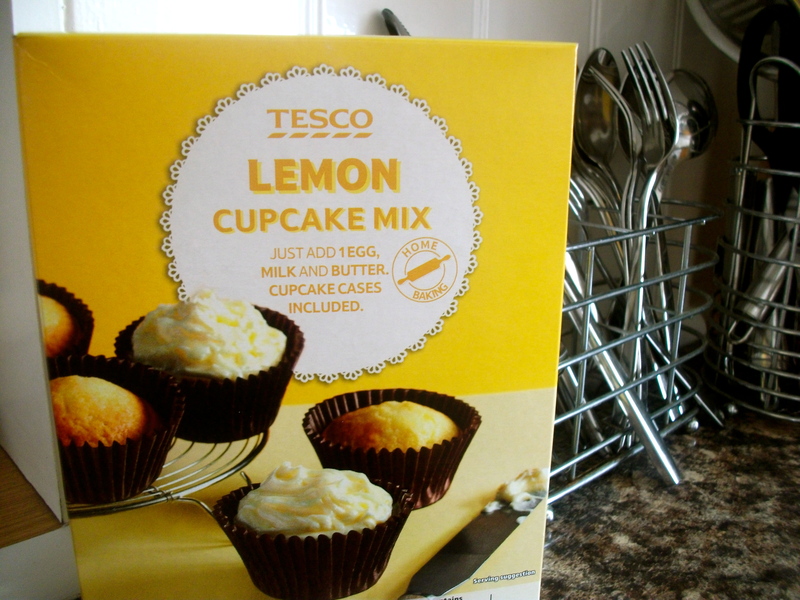 So, this week, I decided to try out this Lemon Cupcake mix from the Tesco baking range. I admit, the main reason for choosing this particular mix was because it was on offer for a £1, but seeing as lemon is one of my absolute favourites, I was interested to see whether the lemon from a packet mix was powerful and as tasty as what it could be when fresh. There are a few ingredients you need to provide for this cake mix including an egg, milk and some butter but these should be items you’d have already. I thought that the sponge was very light, it’s was springy to touch and a really soft and delicate cake. I was a little worried about how the texture of the cake would turn out seeing as the cake mix when whisking seemed a little lumpy but this seemed to sort itself out in the oven. Although the lemon smell wasn’t particularly strong when making the cake batter, the cakes did have a nice lemon flavour and they were a good size, true to the picture on the box. 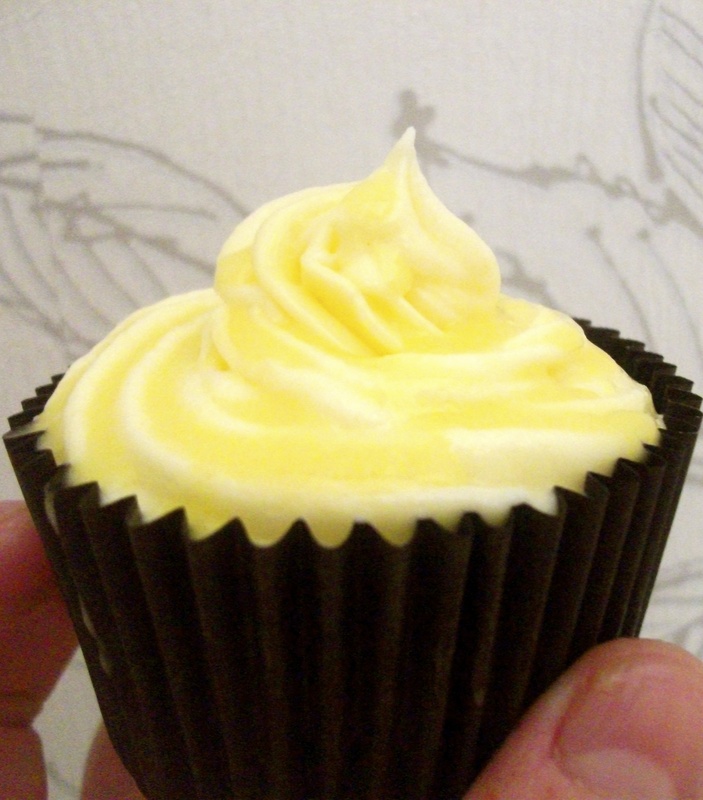 The icing was pretty nice too, it had a really good lemon flavour which I was pleased with. The only thing I thought was that the icing was a little tight, it was just enough to cover all 6 cupcakes, especially if you decide to pipe the icing on like I did. Nevertheless, for me the icing was the best part of the cake. So if you’re looking for a quick cake mix, I’d definitely recommend you give this packet mix a go. If you can get it for a £1 like I did, that’s even better, what a bargain! 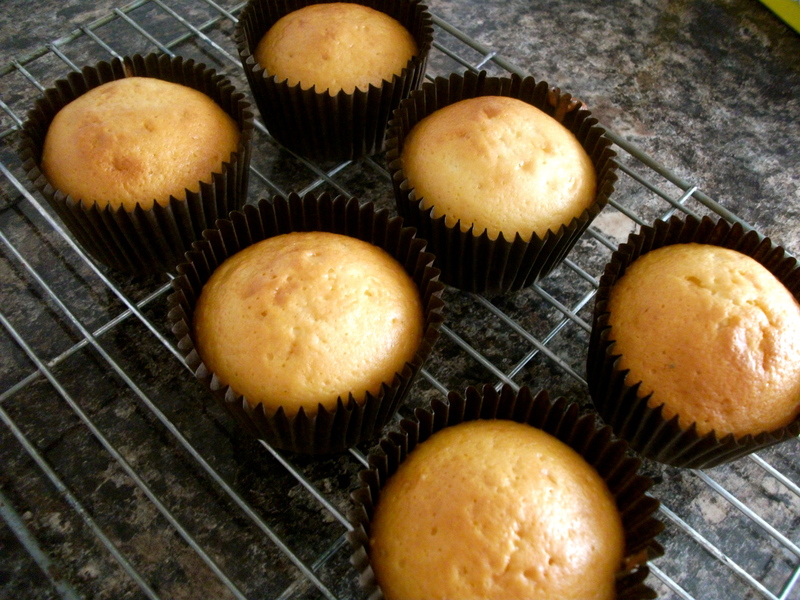 But overall, these cupcakes were really light, a great size and had a delicious lemon flavour. Not so much of a recipe for this post, but these were too good not to share. 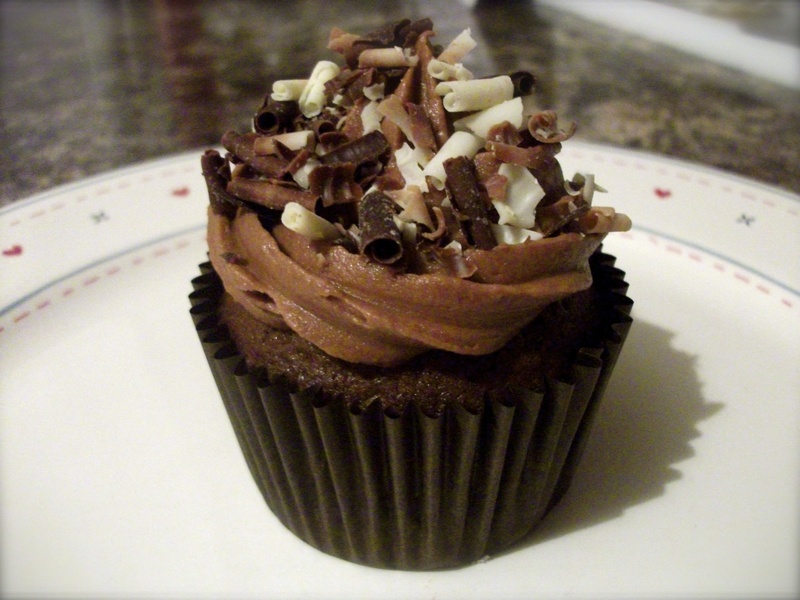 A few weeks ago whilst I was waiting for Britain’s Got Talent to begin on TV, I thought I’d try the Betty Crocker’s Devil’s Food Cupcakes mix that I had in the cupboard (only because it was on special offer at the supermarket!) and I was thrilled with the results. 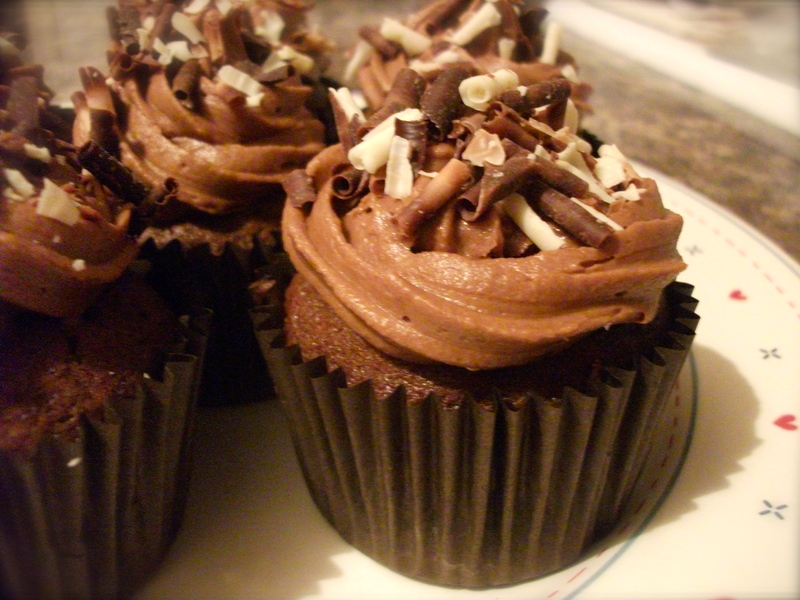 Out of the 9 cupcakes made, I managed to eat 5 (I would have eaten them all, but thought I’d better share them round!) The cakes were light and fluffy and the icing was delicious! If you spot this cake mixture when your out and about shopping, I’d definitely recommend that you give them a go! 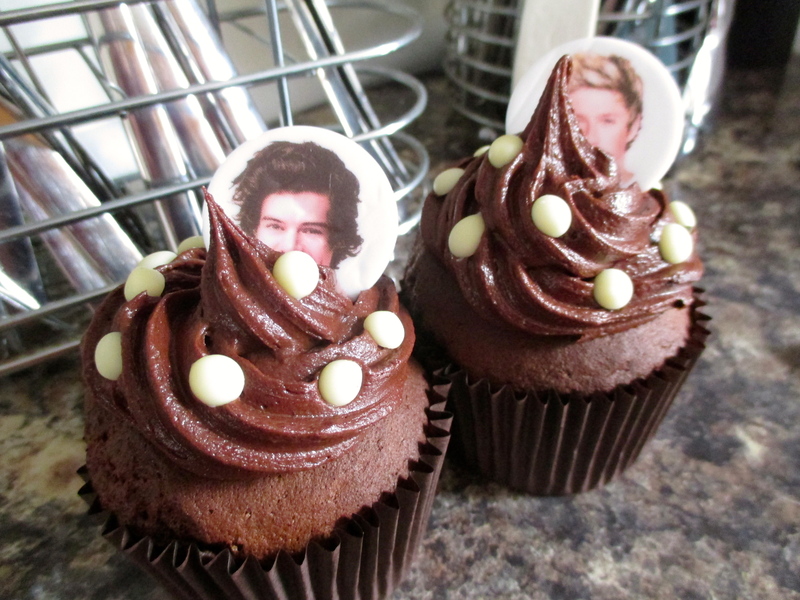 Included in the packet is the Devil’s Food Cupcake mix, icing and chocolate sprinkles. 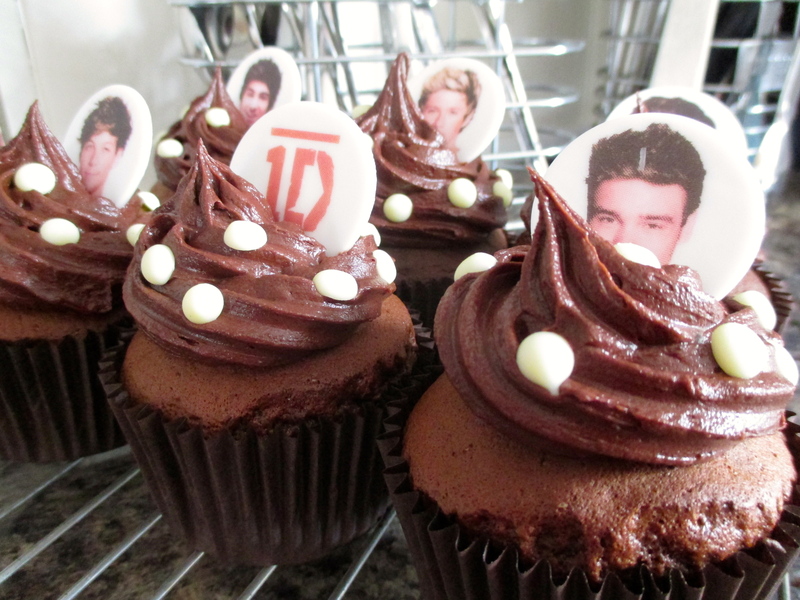 All you need to add is oil, eggs and water for the cupcakes, and butter for the icing. The cakes were a good size, which is often unusual for packet mixture and there was plenty of icing – in fact perhaps too much! So, you definitely get your money’s worth with this mixture! Taking around 30 minutes in total, these cakes were ready just in time to settle down in front of the TV ready for Britain’s Got Talent! 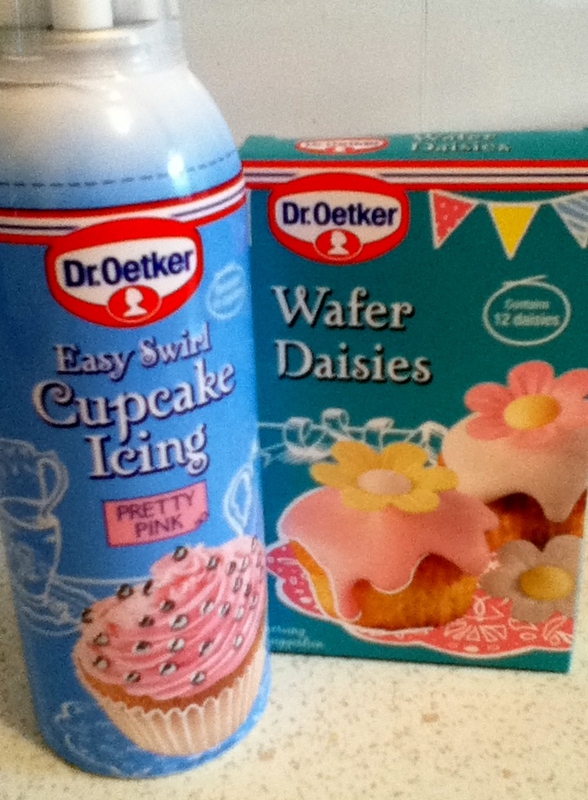 So the purpose of these cupcakes was to test out the new Dr. Oetker cake decorating range as ever since I’ve seen their new snazzy advert on the TV, it’s been something I’ve been meaning to try! 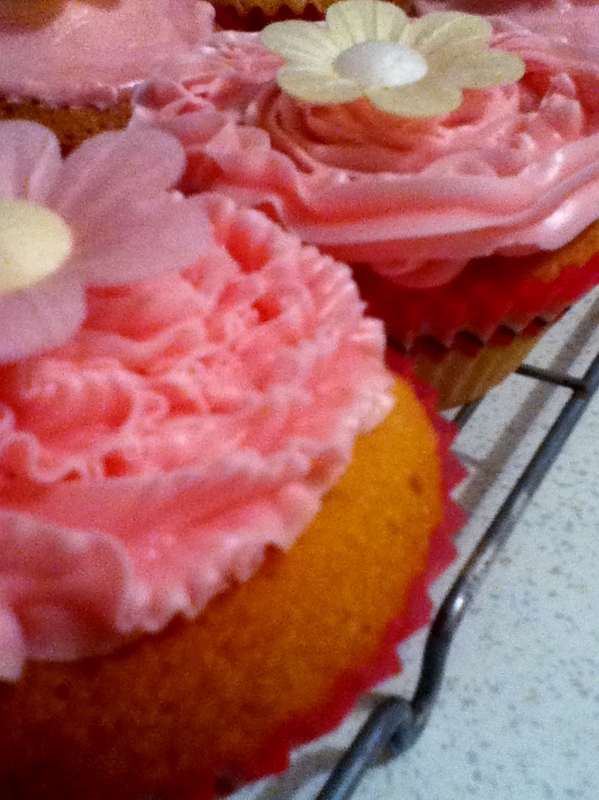 So this week I thought I’d test the Easy Swirl Cupcake Icing and their Wafer Daisy decorations. I thought the icing would be pretty easy to use being in a can, I imagined it to be just like a squirty can of cream however there are four different nozzle styles on this icing and to squirt your icing you have to actually press the nozzle your using which I found at times to be very hit and miss as it’s quite difficult to control. Nevertheless, after a few attempts I did get the hang of this hence why in my pictures some look fancy and others look well, a bit of a mess! Oh and I should mention that by the end I had managed to break all four nozzle styles.. oops! On average, this icing should be enough for 10 cupcakes yet I managed to stretch this to 12 as on some I was a little sparing with the icing. 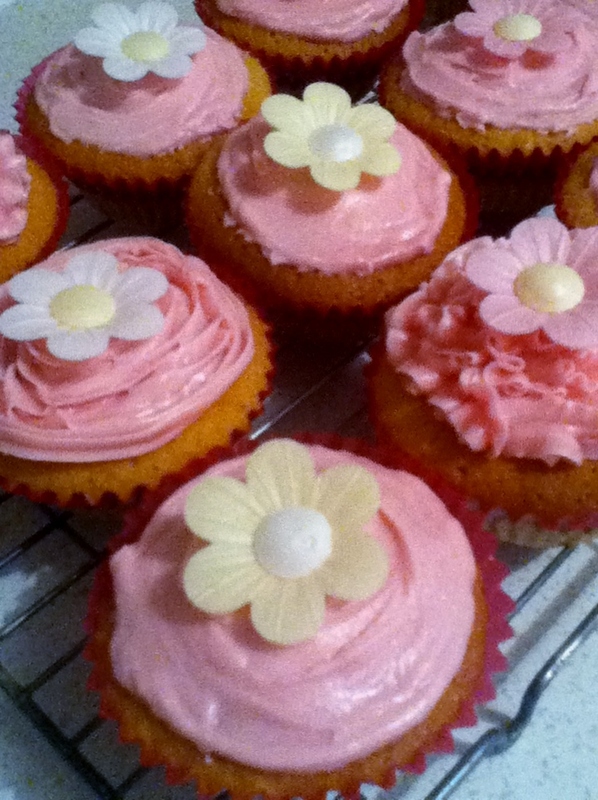 The wafer daisies were pretty cute, very delicate and made the cupcakes with disastrous icing look good! So, if you want to make these yourself, just follow this standard fairy cake recipe and then decorate until your hearts content! 2. Place 12 fairy cake cases in a cake case tin. 3. Cream together the butter and sugar until it becomes a light, fluffy mixture and pale in colour. 4. Add in the 1/2 a teaspoon of vanilla essence if required. 7. Once your cakes are cool, its time for the fun part – decorating! 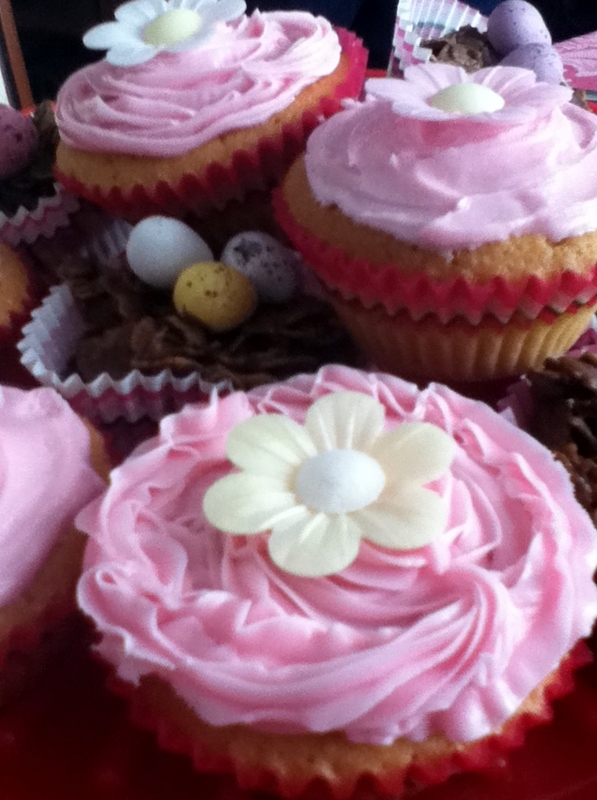 Swirl, squeeze, spoon on icing, add flowers, sprinkles, jelly-beans – whatever you fancy! 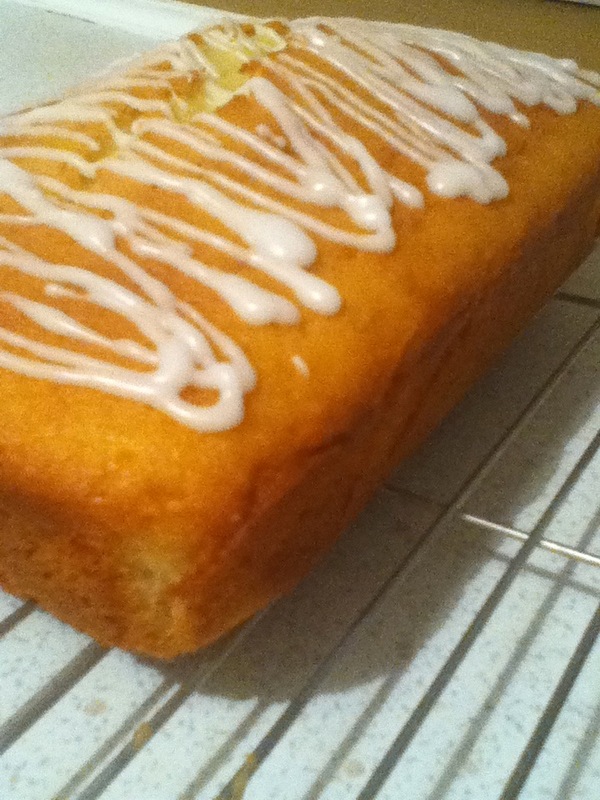 Included in in your Sunny Lemon Cake Mix is the cake batter and the lemon glaze icing. This cake is so simple to make. 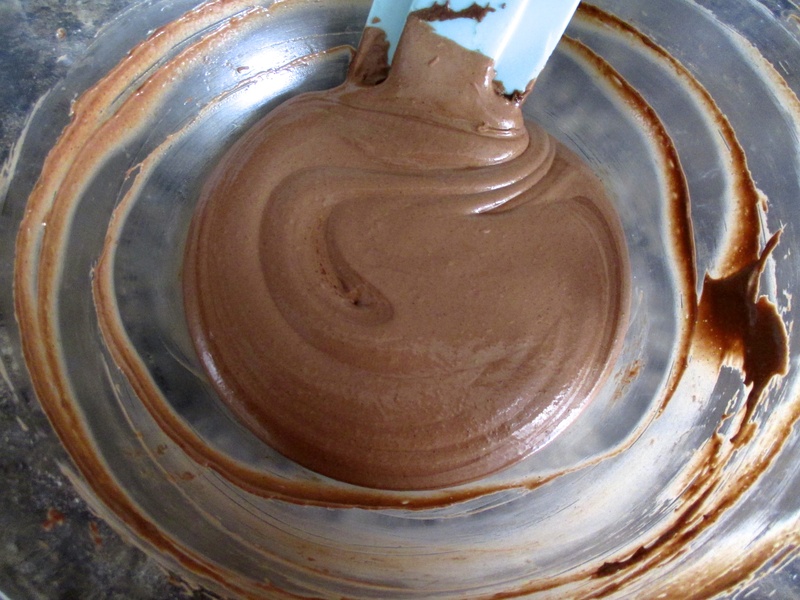 All you need to do is ad d eggs, oil and water to the cake mixture and bake! Literally, it will take you a few minutes to prepare the batter before putting it in the oven. Honestly, it took longer to grease and line the tin than it did to actually make the cake! For the icing, add a splash of water and drizzle on your cake and thats it! The icing is so yummy, it has a great lemon flavour but sweet too, there is a good amount so if your like me with a sweet tooth, its perfect! 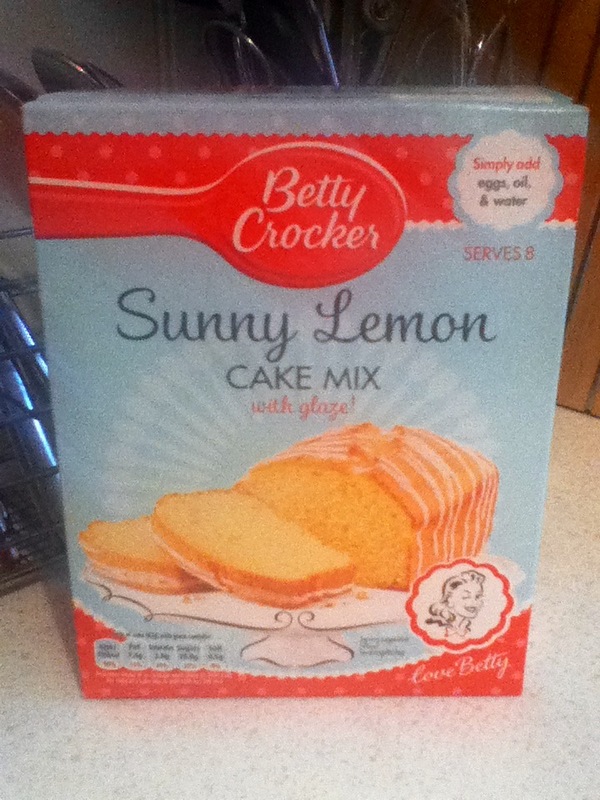 So, if you don’t fancy baking a cake from scratch and just want something easy and fun to do on a Sunday afternoon, I would highly recommend this Betty Crocker Sunny Lemon Cake Mix, it’s quick and easy, uses ingredients you’ll have in the cupboard and most importantly it tastes great! My only advice to you is, if your going to bake a cake using cake mix and pass it off as your own – just don’t get caught!